I am delighted to announce that books two and three of my Accidental Prophet trilogy have now been published! 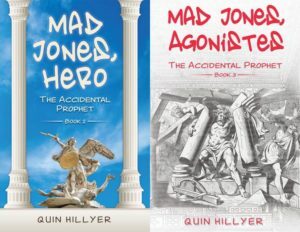 Mad Jones, Hero and Mad Jones, Agonistes complete the story begun in Mad Jones, Heretic, which was published last fall. You can order them — in fact, please do order them! — here, here, and here. This link is a good compendium page for anything you might want to know about Heretic. The character Madison (Mad for short) Lee Jones is a young history teacher in Mobile, Alabama in 1998 who, having suffered a series of tragedies, writes a series of religious theses to “vent” at God — and then affixes them (via thumb-tacks) to more than 100 church doors in Mobile and New Orleans. In this, he is like a modern-day Martin Luther, who did the same thing 500 years to the exact day before Mad Jones, Heretic was published. Yet Mad was just venting; he had no intention of anybody taking him seriously. But with the dawn of modern social media, he unexpectedly develops an overnight, national following, abetted by a clueless media (some might call it “fake news”) which misunderstands or misrepresents what Mad is saying. The thesis the media obsesses about his Mad’s 12th of 59: “God is a jerk!” Never mind that by 59, he has reached an entirely different conclusion. As far as the media is concerned, there is now a national movement that believes God is a jerk. As this is pure satire, many hijinks of course ensue. It is meant as an entertaining, fun read. But satire is worthless unless it tries to convey, at a second level, some greater insight, or at least tries to ask some deeper questions. Underlying the satire here are age-old questions (but presented, I hope you’ll find, in a new and interesting way) about faith, about popular culture, and about love. Okay, enough said. Please, if you haven’t bought and read the first one, do so now. If you liked the first one, please buy the next two. And if you like them, please take the two minutes it takes to post a comment at the Amazon sales page telling other potential readers why you liked it. (Those reviews are important!) And please tell your friends! Again, the books are available for sale only at Amazon (except for a few remaining copies at Carpe Diem coffee house in Mobile and at Page & Palette books in Fairhope). Again, here, here, and here.